Deep Freeze Puts Strain On Midwest Gas And Electricity Grids Millions of residents are being asked to turn their thermostats down to ensure there's enough gas for everyone. GM and Ford have suspended some operations in Michigan to help conserve energy. 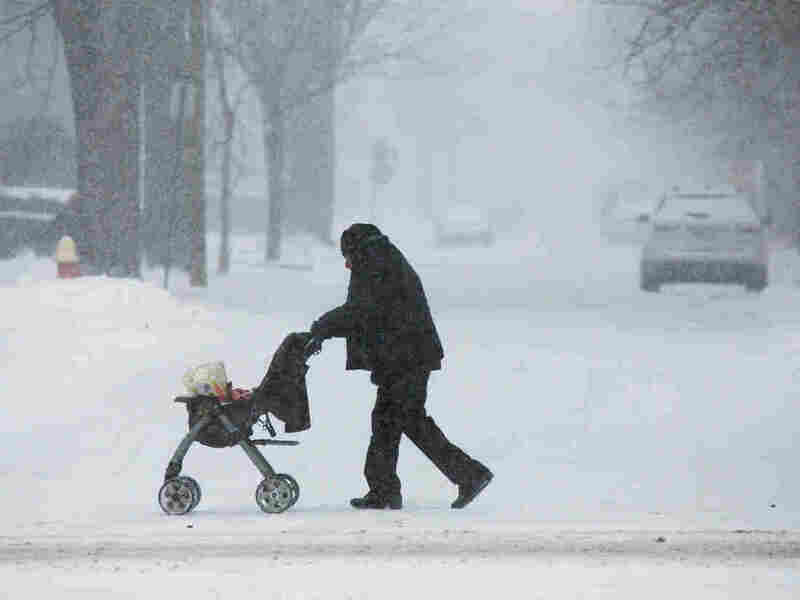 A man pushes a stroller with groceries as flurries swirl around on Woodward Avenue in Detroit on Monday. Millions of Michigan residents have been asked to turn their thermostats down to conserve energy during the Polar Vortex. Ahead of the plunge, grid operators throughout the Midwest had said they were prepared. But this cold snap will be a big test of the resiliency of the energy grid, reports the trade publication E&E News. "The event will be a test of the bulk power system's resilience and especially the ability of coal, natural gas and wind generation to deliver power when called upon." In Michigan, Consumers Energy — which serves 1.8 million residents — asked customers to set the temperature at 65 degrees or lower until noon Friday. In a Facebook Live video, CEO Patti Poppe pleaded with residents to do their part. The low temperatures created "record-breaking demand" for natural gas. The system worked perfectly, she said, until a fire broke out at a major natural gas compressor station Wednesday morning, making it harder to deliver gas to customers. If customers ignored the request, they could be in for brief, localized shutoffs, The Detroit News reported. "This truly is an unprecedented crisis," Poppe said. "We have never been in this situation before." General Motors said it would suspend operations at more than 11 plants and asked 20,000 employees at its Warren Tech Center to stay home through Friday, according to Crain's Detroit Business. And Ford Motor Co. said it would lower the temperature at some plants and stop heat treatment and paint production, according to the Detroit Free Press. "I'm asking that you please, tonight, turn down your thermostat," Gov. Gretchen Whitmer echoed in an online video, citing the Consumers Energy request. "Every one of us can play a role in making sure that we get through this with minimal harm. We're calling on every Michigander to do your part and to help us weather this storm together." Late Wednesday night, "cellphones chimed with an emergency alert" again asking customers to lower their heat to 65 or less, reported Michigan Radio's Tracy Samilton. DTE Energy, which provides electricity to millions of customers in southeast Michigan, also asked customers to reduce their electricity usage. "While DTE's plants are running well, our system is connected to energy grids in other states and Canada that are experiencing issues due to the extreme weather," said Christy Wicke, executive director of generation optimization. "Because of this, we are asking for your support to ensure everyone can stay warm." In Minnesota, Xcel Energy asked customers statewide to keep the heat to 63 degrees or lower through Thursday morning. About 150 customers had already lost natural gas service, and Xcel offered to put them up in hotels, Minnesota Public Radio reported. The storm is re-creating conditions similar to the 2014 polar vortex, trade publication Utility Dive reports. That weather event is often used by Trump administration officials to justify its proposed grid resilience rule, "which would provide cost recovery to plants that keep 90 days of fuel supplies onsite," Utility Dive said. The Midcontinent Independent System Operator, which monitors the energy grid across parts of the U.S. and Canada, had warned operators to be ready for frigid weather from Jan. 29 to Feb. 1, trade publication RTO Insider reported. The arctic blast even knocked out power to MISO's offices on Wednesday. MISO declared a "maximum generation event" for Thursday morning, "stirring to life idle power plants from Minnesota to Louisiana to meet demand," the Minneapolis Star Tribune reported.